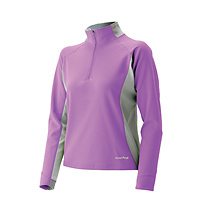 For late winter and spring skiing this year I slipped into Montbell's zeo-line 3D Thermal Long Sleeve Zip Shirt. Quite the mouthful isn't it? Fortunately it's a lighter and less complex piece than it's name implies. 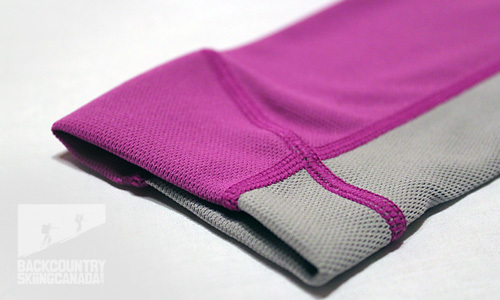 It's a polyester thermal base-layer or mid-layer that promises to be high-wicking and warm. 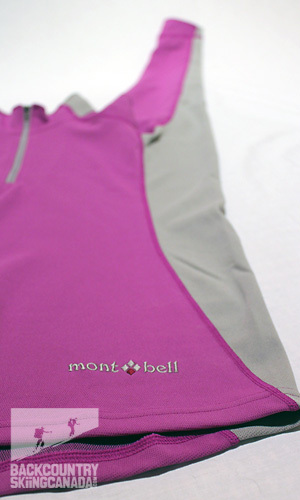 As with many of Montbell's pieces, the technological benefits lie in the unique fabrics that they develop and source. In this case it's Zeo-line 3D fabric. From the sounds of it a lot of time and energy has gone into developing this fabric. First of all it is made up of two types of fibres. Antibacterial, conjugated fibres of wool-like polyester are woven into the underside of the fabric giving fleece-like feel. Anti-pilling, spun polyester fibres made with bulky thread make up the fine honeycomb weave on the outside. The 3D effect comes into play because together, the two layers sandwich a third, middle layer of trapped air where moisture absorbed from your skin can spread out and evaporate more quickly. So the inside layer absorbs the moisture and the middle and third layer pulls it through resulting in a highly breathable and also super quick drying fabric. 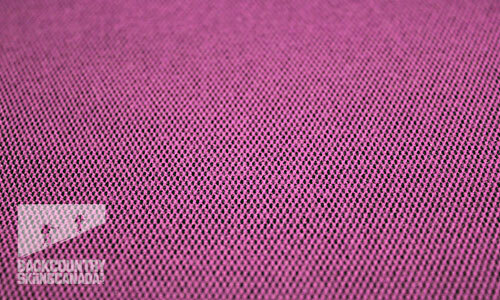 Close up of the Zeo-line fabric. Two tone fabric and stitched logo - nice. 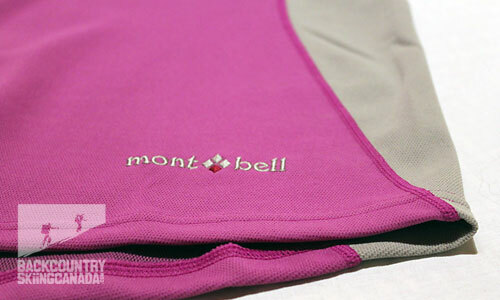 Mont Bell have used flat-lock stitching throughout to minimize bulk and chaffing. Clean simple lines have been used and body contours accentuated with the use of two tones of fabric. All seam placements are strategic with no shoulder seams, underarm seams or seams directly in the side waste where they would be more likely to wear and create bulk. Beauty shot and action shot. Details such as MontBell's signature SLANT-TEC™cuffs give the shirt a sharp finish. I recently wore this shirt for five days on the Wapta ski traverse and I loved how it felt and performed. It's a much warmer shirt than most shirts of it's weight. The wicking capabilities ensure that the inside layer of fleece-feel fibres are never saturated so when you stop at the top of the up track you don't feel chilled. The underside feels soft on the skin which combined with the cut makes a very comfortable layering piece. In keeping with my experience of other MontBell gear superior quality construction has been used. Oh and on the last day of a five day traverse, it still performed sans-stench, nice work Zeo-line 3D! I would be tempted to give this a perfect score save two caveats I had. The first is that it's a little short in the torso so be sure to go a size up, I am normally a medium but the large was a better fit for me due to length. Secondly—an unfortunate side effect of wear and tear—the weave of the fabric makes it susceptible to threads being pulled by rough surfaces. I found that on areas such as my elbows the threads were being pulled from cabin table surfaces and on the arms a walk by a tree would leave a few threads hanging. It's a difficult thing to avoid when back country skiing but it seems to happen more easily with this fabric. 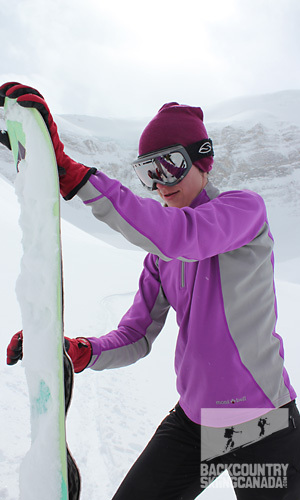 Comfortable, warm and yet very breathable which makes it ideal for backcountry skiing. Great colours especially the iris. Flattering cut. Quality construction. A little on the short side if you are long in the torso. Fabric threads will pull if you rub up against trees or brush so go easy on the back scratching. The one con about this shirt is that the fabrics catch on everything. I have been pretty careful with the Mont-Bell Zeo-Line 3D shirt but the underside of the arms are covered with fabric balls being pulled out by what I consider pretty normal wear. Maybe it's just me but the shirt looks old before its time. 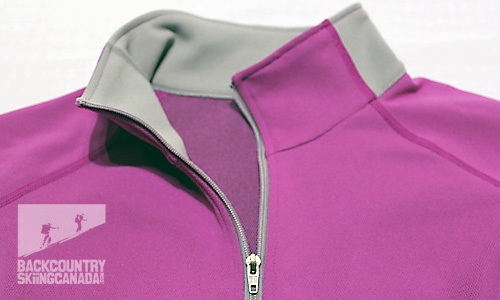 Still plenty warm and functional and a great mid layer, just that one complaint.